You are here Home » Classroom Management » Easily Create Calm & Focus With Yoga in the Classroom! 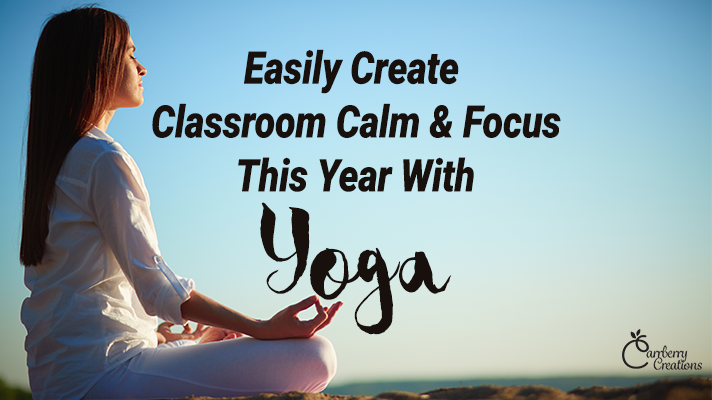 Easily Create Calm & Focus With Yoga in the Classroom! Creating a classroom environment that is conducive to teaching and learning can make or break you this school year. It not only appears on most teacher evaluations, but a calm and focused learning environment will help maximize student learning outcomes. Incorporating yoga in your classroom routines is an excellent way to set the tone for your year. One way I have found for creating a calm classroom environment is through using yoga in my classroom daily. Among its many health benefits, yoga is an excellent method for reducing stress, calming the mind, and increasing focus. Researchers R Rangan, HR Nagendra, and G Ramachandra Bhat wrote in their article Effect of yogic education system and modern education system on memory states that, “…adopting yoga way of life is … effective in enhancing visual and verbal memory scores…” Researchers, Neha Gothe, Matthew B. Pontifex, Charles Hillman, and Edward McAuley with the Department of Kinesiology and Community Health,University of Illinois at Urbana Champaign, Urbana, IL, recently wrote a research paper titled, The Acute Effects of Yoga on Executive Function. Those researchers found that, “…cognitive performance after the yoga exercise bout was significantly superior (i.e., shorter reaction times, increased accuracy) as compared to the aerobic and baseline conditions for both inhibition and working memory tasks.” In other words, Yoga can help your students stay focused and improve their memory, both are really great reasons to incorporate yoga into your classroom routine this year. Today I want to share with you how I incorporate yoga into my classroom instruction daily, and give you a few resources you can use to get started adding yoga to your students’ day as well. In my classroom, before starting our morning meeting we pause and spend approximately 30-60 seconds thinking about breathing deeply. I play a song from one of my yoga CDs. Then we sit “criss-cross applesauce,” close our eyes, and take 2-3 deep breaths and try to pay attention to where the air is moving in our chests. I tell them to think about it like an elevator and see how far the elevator can go down before it comes up again. We repeat this exercise after returning from being out of the classroom as well. Sometimes if we are especially wiggly, or stressed we may also stand and as a class practice a few yoga poses as we listen to the yoga CD and get refocused for learning. At most we take the length of one song (3-4 minutes). Yoga has become one of my students’ favorite activities for inside recess. In colder months students often request that we work on yoga stretches together during our recess break. Sometimes we put on a CD and grab cards from my yoga pretzel deck, other times we put a yoga for kids video up on the smart board and follow along. A favorite of ours are the ones found on the Cosmic Kids Yoga You Tube channel. Cosmic kids yoga videos have children acting out stories with their yoga poses, and can be more high energy than relaxing. Kids love them and they are great for inside recess days. In my classroom, I have a time out corner, because let’s face it sometime we need to walk away and calm down. However I do not call it “time out”. It is a yoga break center, and all students are welcome to use the center when they need to. When students choose to enter the center they set a 5 minute timer. Then they can stretch out on a yoga mat, and listen to a yoga CD on a cd player with wireless headphones. There are moving pieces of art in the center which students can shake up and watch the things inside settle and change. The center itself is no bigger than a yoga mat, which since my students are much smaller than a regular yoga mat, I cut the mat to be more to their size and that is the size of my center. My yoga pretzel deck is housed on a small shelf in this center, and I have yoga pose posters hanging on the wall. When the 5 minute timer goes off students are encouraged to try to return to the class for at least 10 minutes, but they know they can always return to the yoga break center if they need to. A yoga mat, or small carpet. Either should be sized long enough for a child to stretch out completely on it. They can be folded/rolled up and put to the side when not in use, but it is generally best to have them open and ready for a student to use when needed. Yoga CDs or CDs of classical music, a music player, and headphones students can use. I have some Yoga CDs I ordered from Amazon, CDs or classical music, and CDs with sounds of nature on them. I try to cycle out the CDs every few months to keep students from getting bored with them. Something relaxing to look at. This can be pictures of nature, or movable art. By moveable art, I mean things that can be shaken up so that students can watch them resettle. has a fabulous tutorial on how to make the time out timer pictured to the left. If you choose to try out using yoga in your classroom this year, I would love to hear about it! I LOVE this post, Mary! I also do yoga with my kids but I love the idea of your yoga corner!! I’m going to relook at my room layout to see where I can implement this!! Thanks! !